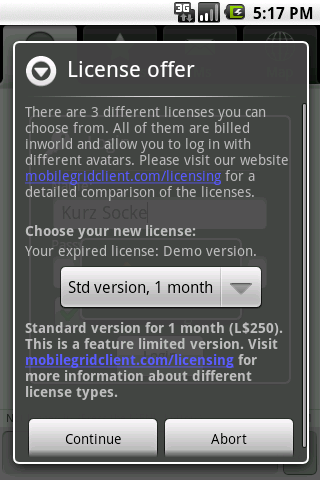 Mobile Grid Client can be downloaded for free, but to use the service you need a valid license. Payment is done inworld on next login after your current license has expired and by the avatar used for login. The client will ask you explicitly for payment. If you log in for the first time you get a 14 days demo license for free. The Demo version license is feature equivalent to the Pro version license. There is a Standard and a Professional version license. The Standard version is limited in some aspects, have a look at the comparison table below. The Standard license is only available on a monthly basis while the Professional version is also available on a yearly basis. License fees are NOT recurring, you always get asked before renewal and payment. No special action is required. 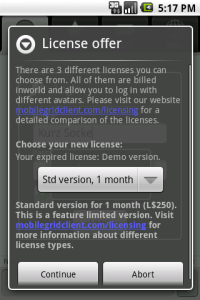 The client itself will offer you a license on login if your current one has expired. If you log in for the first time you automatically get a 14 days demo license for free. For phones with a SIM card (e.g. GSM and UMTS phones) the license will be tied to the SIM card (SIM card serial number). For CDMA phones and other phones without a SIM card the license will be tied to the phone itself (in case of CDMA phones to their MEID). That means once you have acquired a license you can use it with different avatars. And if you are using a GSM or UMTS phone you can even change your phone as long as you use the same SIM card.